A 1.6-magnitude microearthquake was recorded in Southampton, New Jersey, on Thursday, June 21, 2018. 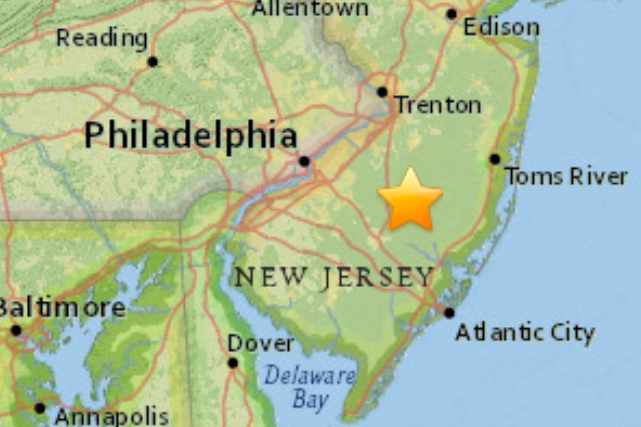 Burlington County residents may have a felt a small rumble overnight Thursday courtesy of a miniature earthquake that struck near the Leisuretown section of Southhampton Township. The low-intensity "microearthquake" occurred around 12:28 a.m. at a depth of 12 kilometers, according to the United States Geological Survey. With a 1.6 magnitude, it's unlikely the quake was felt much beyond a radius of five miles. Researchers at Michigan Technological University estimate that more than 900,000 earthquakes below magnitude 2.5 occur every year. While the event registered as little more than a blip, even small-scale seismic activity can be an indication of future earthquakes, according to a 2006 study out of Stanford University. Residents across the Mid-Atlantic region experienced a distinct shaking sensation last November when a 4.1-magnitude earthquake struck along the coast of the Delaware Bay, about 53 miles south of Philadelphia. The largest earthquake to hit Philadelphia in recent memory came in 2011, when a 5.8 magnitude quake centered in Virginia sent tremors through the city and was felt from Georgia to Canada.